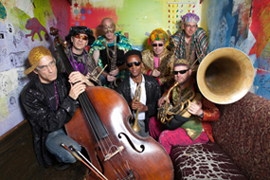 Revolutionary Snake Ensemble's Mardi Gras Show w/ special guests Godwin Louis (alto sax) and Jason Palmer (trumpet); also celebrating RSE's 25th anniversary. At the Regattabar in Cambridge, MA on Tuesday, February 9th, 2016. CAMBRIDGE, Mass. - Jan. 8, 2016 - PRLog -- Revolutionary Snake Ensemble Mardi Gras Show with special guests Godwin Louis and Jason Palmer.Tuesday, February 9, 7:30 pm. Tickets: $20, Students $15. Regattabar at the Charles Hotel, One Bennett Street, Cambridge, MA 02138. For tickets and information: 617-395-7757, 617-661-5000, www.regattabarjazz.com. It has become a Boston Mardi Gras tradition with the Revolutionary Snake Ensemble returning to the Regattabar for their annual Fat Tuesday party! This time around to also celebrate the 25th anniversary of the band's founding! The regular ensemble of Tom Hall (tenor sax), Ken Field (alto sax), Jerry Sabatini (trumpet), David Harris (trombone & tuba), Blake Newman (bass) and Phil Neighbors (drums) is known to get a furious dance party going, but with the addition of Jason Palmer (trumpet) and Godwin Louis (alto sax), the dancers are bound to go airborne. Two-time New England Music Award nominees Revolutionary Snake Ensemble's most recent release "Live Snakes" received airplay on over 100 radio stations throughout the US and Canada, received an Editor's Pick in Downbeat, and was listed on the CMJ Jazz Top-40 chart for almost 3 months. The CD appeared on a number of Best of Year lists, including from CMJ, Tom Hull on the Web, WWOZ (New Orleans), and WMSE (Milwaukee). The New Orleans magazine "Offbeat" called Live Snakes "a stone cold killer diller! ", adding that "most bands can't get the New Orleans stuff right, but the Revolutionary Snake Ensemble is one of the few who does and then takes it in fascinating directions". CriticalJazz.com called it "Spectacular", and compared it to "Mardi Gras on steroids ...Take everything you thought you were familiar with in terms of the music of New Orleans and wipe the slate clean. Boston based Revolutionary Snake Ensemble takes that Crescent City vibe to the next level with a live release that will set your hair on fire!" The New York Times has also weighed in on the group's "sinuous, writhing counterpoint," and Time Out New York called it "Sizzling!" In the online blog "Step Tempest," Richard Kamins hit the nail on the head when he wrote that "Revolutionary Snake Ensemble finds joy in the rhythms of the street, in the melodies of the everyday, and in the shouts one creates against the darkness." Check out www.youtube.com/watch?v=Cj7_L5ClOuI to get the idea. then takes it in fascinating directions."